We are very pleased to introduce the January/February 2017 issue of World Neurology, with a number of varied and quite interesting reports from around the globe. Drs. 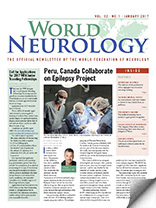 Jorge G. Burneo, David A. Steven, and Miguel Arango describe the fruitful ongoing collaboration between Canada and Peru on a project to provide high-level epilepsy surgical care in Peru. Drs. Peter Spencer and Jacques Reis report on the International Meeting on Environment and Health that recently took place in Strasbourg. Dr. Gallo Diop reports on the recent exciting announcement of the process and promotion of seven neurologists within Africa to the rank of professor. In this issue’s President’s Column, WFN President Raad Shakir notes that brain health is at the forefront of diseases leading to morbidity and mortality, highlighting the critical importance and role of neurologists in increasing the profile of neurology as a discipline around the globe. Dr. Bruno Giometto reports on the highlights of the recent successful XLVII Congress of the Italian Society of Neurology, and in a related report, Dr. Luigi Bertinato’s keynote lecture from the same Congress on the origins of public health and the history of plague control will be of great historical interest to our readers. Drs. Sergey Lobzin and Natalie Zinserling report from the September 2016 Davidenkov Readings Conference in Saint Petersburg, Russia, and summarize the historical and modern aspects of Saint Petersburg Neurology. In his Editor-in-Chief’s Update from the Journal of the Neurological Sciences, the official journal of the WFN, John D. England, MD, announces the new Elsevier web-based editorial system to provide an improved and streamlined author and reviewer experience for the journal. In this issue’s history column, Dr. Peter Koehler informs us about the history of the discoveries and putative functions of “stones” in the brain. Dr. Michael Ackerl reports on the latest developments of the European Board Examination in Neurology from the European Union of Medical Specialists from their last meeting in October 2016. In what we also hope will be the model of many similar contributions from our readers for future issues, we know readers will appreciate seeing a “Photo of the Issue” that was provided by Dr. Shakir, showing Professor Jun Kimura giving a recent EMG workshop at the Lebanese society of Neurology in Beirut. Dr. Wolfgang Grisold, the Secretary-General of the WFN, and Dr. Alla Guekht briefly report on their international collaboration that resulted in a Russian translation of the American-European Atlas of Neuromuscular Diseases. Also in this issue is the official call for applications for the 2017 WFN Junior Traveling Fellowships. We trust that you will enjoy the many and varied contributions from this issue about neurology around the globe, and we continue to encourage your suggestions and ongoing submissions on news of interest to neurologists worldwide.